Before I begin, please take a few minutes to read this true story as documented in the Book The Element – How Finding Your Passion Changes Everything by Sir Ken Robinson (c) 2009. “Gillian was only eight years old, but her future was already at risk. Her schoolwork was a disaster, at least as far as her teachers were concerned. She turned in assignments late, her handwriting was terrible, and she tested poorly. Not only that, she was a disruption to the entire class, one minute fidgeting noisily, the next staring out the window, forcing the teacher to stop the class to pull Gillian’s attention back, and the next doing something to disturb the other children around her. Gillian wasn’t particularly concerned about any of this—she was used to being corrected by authority figures and really didn’t see herself as a difficult child—but the school was very concerned. This came to a head when the school wrote to her parents. The school thought that Gillian had a learning disorder of some sort and that it might be more appropriate for her to be in a school for children with special needs. All of this took place in the 1930s I think now they’d say she had attention deficit hyperactivity disorder, and they’d put her on Ritalin or something similar. But the ADHD epidemic hadn’t been invented at the time. It wasn’t an available condition. People didn’t know they could have that and had to get by without it. Gillian’s parents received the letter from the school with great concern and sprang to action. Gillian’s mother put her daughter in her best dress and shoes, tied her hair in ponytails, and took her to a psychologist for assessment, fearing the worst. Gillian told me that she remembers being invited into a large oak-paneled room with leather-bound books on the shelves. Standing in the room next to a large desk was an imposing man in a tweed jacket. He took Gillian to the far end of the room and sat her down on a huge leather sofa. Gillian’s feet didn’t quite touch the floor, and the setting made her wary. Nervous about the impression she would make, she sat on her hands so that she wouldn’t fidget. The psychologist went back to his desk, and for the next twenty minutes, he asked Gillian’s mother about the difficulties Gillian was having at school and the problems the school said she was causing. While he didn’t direct any of his questions at Gillian, he watched her carefully the entire time. This made Gillian extremely uneasy and confused. Even at this tender age, she knew that this man would have a significant role in her life. She knew what it meant to attend a “special school,” and she didn’t want anything to do with that. She genuinely didn’t feel that she had any real problems, but everyone else seemed to believe she did. Given the way her mother answered the questions, it was possible that even she felt this way. Maybe, Gillian thought, they were right. Eventually, Gillian’s mother and the psychologist stopped talking. The man rose from his desk, walked to the sofa, and sat next to the little girl. “Gillian, you’ve been very patient, and I thank you for that,” he said. “But I’m afraid you’ll have to be patient for a little longer. I need to speak to your mother privately now. We’re going to go out of the room for a few minutes. Don’t worry; we won’t be very long. Gillian nodded apprehensively, and the two adults left her sitting there on her own. But as he was leaving the room, the psychologist leaned across his desk and turned on the radio. As soon as they were in the corridor outside the room, the doctor said to Gillian’s mother, “Just stand her for a moment, and watch what she does.” There was a window into the room and they stood to one side of it, where Gillian couldn’t see them. Nearly immediately, Gillian was on her feet, moving around the room to the music. The two adults stood watching quietly for a few minutes, transfixed by the girl’s grace. Anyone would have noticed there was something natural—event primal—about Gillian’s movements. Just as they would have surely caught the expression of utter pleasure on her face. She started going to dance school every week, and she practiced at home every day. Eventually, she auditioned for the Royal Ballet School in London, and they accepted her. She went on to join the Royal Ballet Company itself, becoming a soloist and performing all over the world. When that part of her career ended, she formed her own musical theater company and produced a series of highly successful shows in London and New York. Eventually, she met Andrew Lloyd Webber and created with him some of the most successful musical theater productions in history, including Cats and The Phantom of the Opera. You might ask, what has this to do in a blog focusing on suiseki? A good question, so let me spend a few moments explaining why. I’ve been busy at work for more than two years researching how to “view” suiseki stones. It has been a passion that has taken a great deal of my free time. I have read hundreds of papers, research articles, and books on aesthetic with a special focus on Japanese aesthetic. Through this process a discovery was made, for me at least, that there is no true universal definition of aesthetic between cultures and often even between similar groups of people. Most aesthetics focus on the concept of beauty, however, even in this definition beauty can be defined in so many ways. What I have discovered is that most aestheticians link beauty with truth. Rising early to watch the sun break brilliantly across distant mountain tops, standing in the late afternoon on the rocky shores of the ocean seeing and hearing the waves break below, or watching the inherent beauty in a small child asleep and at peace. There is not only beauty but real truth in these scenes. At some future point, it is my hope that all of this research will be gathered and focused into a book that will help its readers to begin to define their own aesthetic regardless of the artistic outlet be it stones, painting, or something. Returning to the story of Gillian, one can only imagine the loss to the world had the doctor not intervened to declare there was nothing wrong with Gillian – she is just a dancer. How many artist, dancers, writers, photographers, comedians have been lost to the world simply because they were viewed as different? And tragically so, treated as if they were broken. Let’s juxtapose for a moment ourselves into the world of suiseki for a moment. How often have we stood before a beautiful stone asking someone what they see and before they can even respond we admonish them in what we see in it. If you take note, you might see a small frown appear on the other person’s face? How often do we see people courageously describe what they see in the stone for the “expert” to immediately bark at them that what they are seeing is wrong that it is not “A” but their viewpoint “B.” How many new participants in our art form have we driven away because we haven’t allowed them to participate and for them to have an opportunity to express what they see! It reminds me of when Masahiko Kimura created this now famous bonsai. Upon its initial release, this was frowned upon by the bonsai world. It wasn’t bonsai; it didn’t follow the accepted practices of the time. Surely there were other forest plantings, but they were in a pot, or slab, that was horizontal to the ground. This design broke the conventional rules! Over time it became recognized as a master work of design. Expressive, beautiful and now often mimicked by others. Anytime there is a major change in an art style such as realism to impressionism the holders of the standard fight to maintain that hold and thus feel inclined to reject the new. In the same way, who knows, the very person who seems to be breaking the rules today may very well be creating a new form of art tomorrow. This is the third part of this story and comprises the final section. 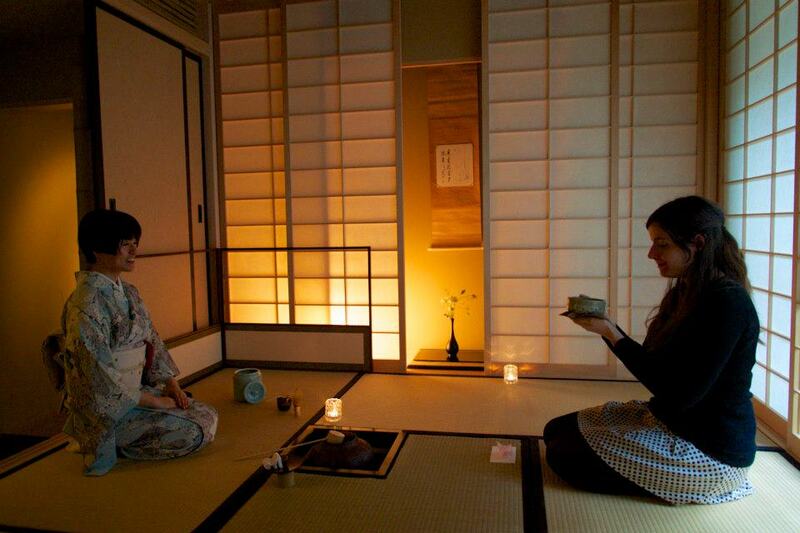 Let us continue with Kakuzō’s writing on the tea ceremony. This so reminds me of a story that my good friend Mas Nakajima relayed to me in one of our study sessions. Mas’ teacher, Mr. Hirotsu, spent many afternoons discussing suiseki with him. On one occasion he gifted him with a stone. Mas was in his mid-30s and had admired a number of Mr. Hirotsu’s suiseki. When he was gifted with the stone above, Mas was quite unhappy. He had hoped to be gifted with a more traditional stone which would show the beauty of a landscape. As he told this story a large smile came across Mas’ face as he continued to describe to me that his appreciation for this stone has grown over the years as he realized that Mr. Hirotsu was teaching him that the spirit of Zen in the stone can far outweigh the style of the stone. Mas continued to describe the stone in attributes of it being quiet, humble and very modest. If you would like to acquire this interview of Mas and his wife Janet, it can be found in the magazine Works and Conversations, Number 32, entitled Living on Earth. You can obtain a copy by emailing rew1428@gmail.com. If you would like to read this article online – please click here. As Mas was my mentor, I took this story to heart as I vividly recall times he would look at a stone that I had found and remark that is was good suiseki. I struggled to see it frankly, and that was quite exasperating. The best example of this occurred on a collecting trip with him and his wife Janet to a lake in Northern CA known for its beautiful Jasper stones. It was coincidentally my birthday and I very much looked forward to this trip as it was just the three of us that day; to have time alone with your mentor is to be treasured. Mas and Sam studying a stone on the Trinity River in 2013. I have to admit that quietness was unsettling. I had experienced enough times bringing stones to Mas in my early days of collecting for him to politely, but firmly, inform me that the stone wasn’t good suiseki, thus my fear was am I wasting his time once again? I’m sure all students standing before their mentors have had similar encounters. Mas continued to study the stone and he finally simply said “I will trade all the stones I have found today for this stone.” Now mind you, he had collected more than 20 stones that morning. I’m not sure what emotion swept through me more – one of I must have found a spectacular stone or two what am I not seeing! I thanked Mas and asked for him to describe what he saw. He then took me through an observation of the stone and how he saw in it an ancient mid-1700s tea cup. He smiled at me and said that I had found my meiseki; the designation for a very rare stone due to their outstanding qualities and beauty. My heart soared with joy! So at the Sung critic stated “In my young days I praised the master whose pictures I liked, but as my judgment matured I praised myself for liking what the masters had chosen to have me like.” I would like to think I’m on that same journey of liking what my master (Mas) had chosen for me to like. One hundred and ten years later nothing has changed in this regard. I still observe, and have participated myself, in indiscriminate collecting. We seem to enjoy the “hunt” of finding art but yet then spend almost no time being taught by it. In retrospect, I think of the number of inferior stones that I have purchased when I could have aggregated my funds to obtain a specimen where much could be learned. In many ways this is a human normality. When we begin to collect we are unsure of ourselves so we tend to restrict our purchases to smaller transactions. 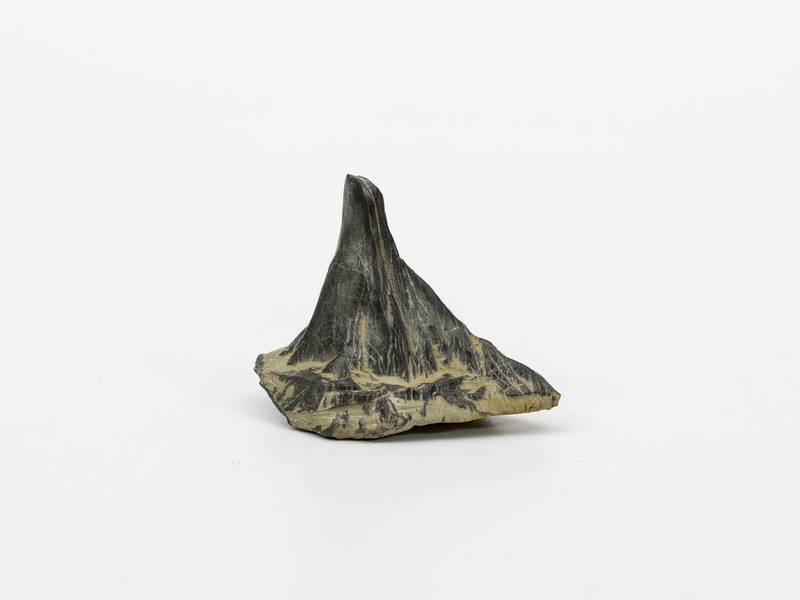 Then as we begin to better understand the art form we expand our collection to include better specimens. Yet, we must be cautious that our collecting isn’t just for collecting sake! Our displays might also reflect this sentiment as well. Are we better to have fewer displays rather than more? Might this allow more contemplation rather than just seeing? Again I wish to make clear; I’m not referring to today’s suiseki shows in the US in a denigrating way, not at all. I clearly understand the needs of most clubs to share their member’s stones. I do though think we need to think of suiseki in terms of a real art form worthy of being shown amongst some of the finest paintings and sculptures in our best museums. In this setting, those that are so inclined will have only an opportunity of introduction as well as a few moments to reflect and contemplate these natural forms. As we close our study of The Book of Tea, perhaps the following this text will resonate with you. It is from the Taoist tale of the Taming of the Harp. The story well illustrates the mystery of art appreciation. This last paragraph is eloquent and holds great truth. As we think of encountering beauty, be it a painting, a sculpture or a stone, memories are brought back to us – good or bad – and often as stated with a new significance. The work of art, its beauty, and those memories somehow become intertwined and become a part of us and thus we become a part of the masterpiece itself. My mentor and friend Mas Nakajima passed away on September 10, 2018. For many of us and especially for me this is a tremendous and very personal loss. As I struggle today to comprehend the loss of my friend, I can truly say that Mas will never leave my heart. He taught me so much. Many of the things that he taught me I’m only now beginning to understand. I truly miss him. There is a passage in this Book of Tea that I wish to dedicate to my friend Mas. If you haven’t read Part I, we suggest you do that before beginning Part II. Let’s for a moment leave the tea-room and discuss how this concept adds value to suiseki display. Does our display concept allow for this “leaving something unfinished for the play of the imagination” to complete? 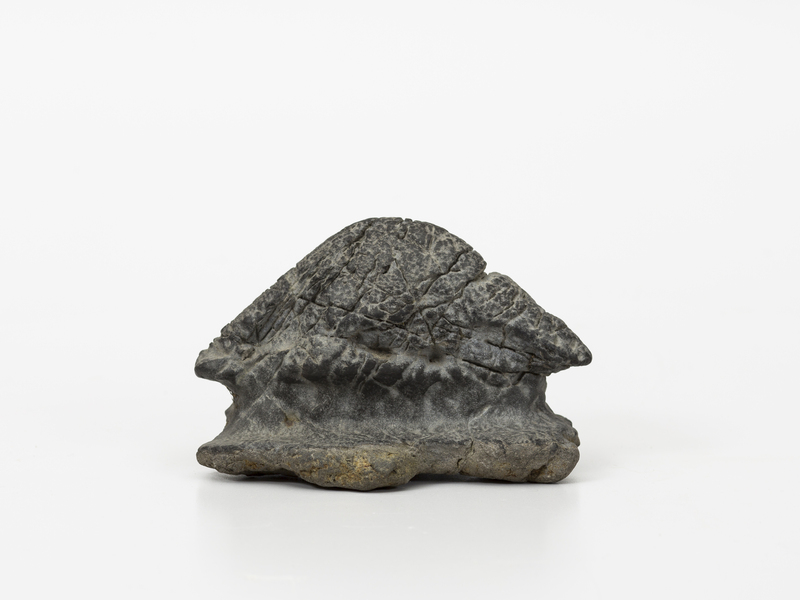 Let’s take a moment to study this brilliant stone from the Iwasaki collection. Before you proceed into the following text take a moment and truly study this stone. Click the above image to see the full resolution photo while also obscuring the text. Spend 3-5 minutes observing each aspect of the stone and its display. See you back in a few! I hope you will agree that this is a fabulous example of suiseki. This Iwasaki stone carries the number 2 in kanji character form and also the number 18. So what do you see? Let’s take a moment to analyze this stone. We find a well-proportioned stone with a distinctive peak that has a beautiful waterfall cascading down the right-hand side of the tall peak. What about the white inclusions we see running across the bottom of the stone? Is this tidal foam or as the name suggests simply the reflection of rain off the landscape? The stone is presented in river sand contained with an older bronze/copper doban that shows great age and patina. The doban is well matched to this stone as there seems to be from the photo just a hint of red in the stone. The texture of the stone and doban is rough – a smooth doban would not seem as congruent with the roughly textured stone, so an excellent choice by its owner. This rather quiet, un-busy display, in our opinion, speaks volumes to this concept of letting us “complete the idea” of what we are observing. How so, let us give just a few thoughts to this subject. When we see this stone our mind’s eye can be taken into two directions, or more. One this distant mountain stone rises from a vast plain. After an afternoon storm, the sun just begins to peak out amongst the clouds and as the heat begins to rise so does the evaporation of the late afternoon rain from the forest trees and plants. Do you recall on a hot summer day after a cooling rain seeing what looks like water evaporation almost like mist rising into the sky? A secondary view might be of a coastal mountain. Now the sand represents the ocean. The waterfall is moving the fallen rain; thus returning it to the vast ocean below. Also we can see the remnants of the tide cascading up the slope of the mountains rocks. If we continue with the later view, we might also add the sounds of gulls, plovers, terns or sanderlings. The added noise of a cacophony of elephant seals might mentally enhance our view of this stone. In a Tokonoma, a scroll might be added to provide some visual clues as to the season, the locale or even the weather. But absent of anything else is this the end of the display or where we should start? I think perhaps that the inclusion of only a few elements allows us a rather quiet, un-busy display, in our opinion, speaking volumes to this concept of letting us “complete the idea” of what we are observing. To stand across the street, so to speak, on this issue is there anything wrong with adding even more elements? No, and especially if this is a display primarily for us or our home. However, might we be wise in a more public setting to allow each viewer to visually and mentally explore the scenes evoked by this wonderful suiseki without too many added elements? Let’s continue with more of Kakuzō writings. Note: The koshikake Machiai is an area for guests, who have come from the Yoritsuki (waiting shelter of the outer garden) and walked down the garden path. Here, they wait for the host to welcome them inside the tea house. It is usually fitted with Enza, individual round mats of woven rush, and an ashtray. In colder months, there is often a small heater for guests to warm their hands. Someone that understood this well was Walt Disney. Disney World is 40 square miles or the same size of the city of San Francisco, CA. Upon taking the exit into Disney Land, Walt was intent in having a great deal of land, thus a drive, before entering into the actual theme park. He wanted to remove you from the busyness outside the park so he could begin to bring you into his magic kingdom. As noted earlier, for me attempting to contemplate suiseki at a show is very difficult based on the number of distractions present. In your mind think through the last experience you had at a stone show. What was that experience like in terms of attempting to contemplate each stone? Museums attempt to correct these problems in how they present art. The room is lit only where it enhances the art, the room tends to be very quiet, and often there is a place to sit and observe. All of these help us to transition to a mode of contemplation. Our Dixon Gallery, located in Memphis, TN, utilizes a tree lined walkway that guides you from the parking lot to the ticket kiosk from where you are led next to a continuation of the tree-lined path leading into the entrance of the museum. This is quite effective at beginning to “calm the soul” before entering into this house of art. 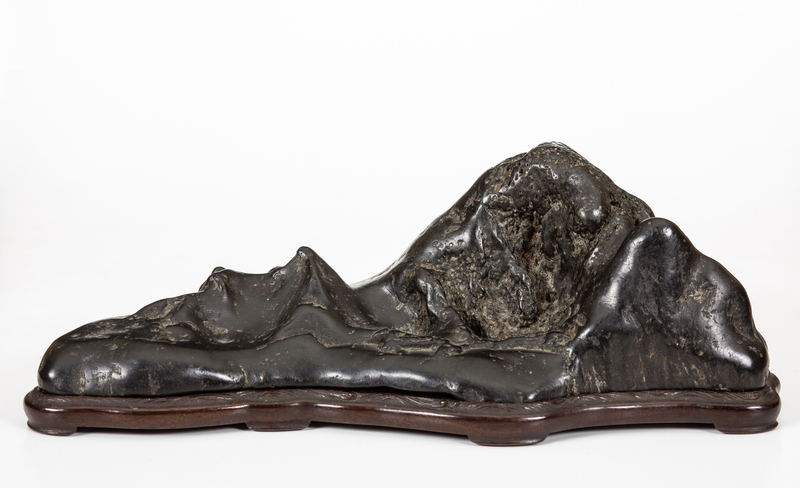 As we think of contemplating suiseki for ourselves, we like many of you, have stones scattered around our house amongst other pieces of art, furniture, rugs, and the like. Frankly, it is so busy it is hard to compare it to this idea of the roji as one approaches the tea-room. Perhaps this is why garden stones were so popular in China and Japan as the ability to set a mood was easier to establish in a garden setting. Before we delve deeper into a potential solution for the contemplation of stones, let’s continue in the text as Kakuzō is about to really enlighten us on what to me is one of the most key attributes of the tea-room. Close your eyes for just a moment and replay this scene in your mind’s eye. As you have walked down the garden path and your mind and soul begin to relax immersed in the trees and moss and soft wind, the approach to the entry to the tea-room creates the need to bend low to move into the room. This requirement of bending down will be discussed later in this post, but remember it well as it is highly important to this experience. Quietly in silence one enters into the tea-room and takes their place amongst the other guests. Entering into this quiet space the outside fades away and we are introduced into a new environment; one where virtually the only noise is that of boiling water in a kettle. Note how the author describes for some it is as if the sea is breaking for others a rainstorm sweeping through a bamboo forest or lastly the soughing (moaning, whistling, or rushing sound) of pines on a faraway hill. This reminds us of his earlier admonition to allow us to complete the idea of our surroundings. I find that I don’t often allow sufficient time for this transition of busyness to quietness when observing to occur. A fast entry into the room where the stone is displayed, an immediate thought as to what I see, my mind racing. This often, perhaps always, leads to a quick review of the stone and then my mind is off to the races again. Is it no wonder that I don’t often see the greatness in the little things of the stone? Shouldn’t we transition from the point of busyness and distraction to quietness so that we can at least give respect to the stone via our full attention? We love the thought of allowing dripping water to be present as the author writes. One must be careful that the environment doesn’t become sterile. To confirm this view, Kakuzō continues. One might propose in establishing a display for our stones this concept of cleanliness but also room for the beautiful and the natural as well should be followed. I seek the reader’s guidance in how this might be accomplished. Should our display include a freshly cut flower in an earthen or bronze vase with water droplets on the leaves of the flower slowly dripping to the surface of the display. Might it be as simple as a grouping of flowers but yet one small petal has fallen to the floor? There is a great deal to digest in these last two paragraphs. Do we merge the idea of vacancy and unsymmetrical into our display methodology? I believe the author is correct that in the West we tend to overwhelm our designs with too many objects—often random and without connection to the whole; but perhaps more importantly too many items thus relegating the viewer to the displayer’s perspective rather than allowing the viewer to “complete the total effect” individualistically. Can we begin to understand the philosophy of stressing the “process through which perfection was sought than upon perfection itself?” This idea of dissymmetry as something imperfect which is in the process toward perfection is difficult to grasp. “Perfection” is grasped as an ideal end to arrive at, whereas the dissymmetry is understood as something which, being imperfect, has not yet arrived at the end and which is halfway to being completed by one’s imagination. So might we then consider that “perfection” is different for each individual, therefore if I as the displayer achieve perfection is that perfection only for me, such then the display must be headed towards perfection thus allowing the imagination of each viewer to continue on the journey to “their” view of perfection. This is such a central core thought for the tea ceremony that it bares spending some time considering its potential influence for the our personal, or small group, study of suiseki. Let’s review the photograph of stone A-12, titled “Araiso” (reef). This is a Kamogawa Shizuhata Itomaki-ishi and is displayed in an oval basin of white Cochin ware. The Iwasaki family stone, number 6 written in red and in kanji the character three in white, is described as a scene of roaring waves dashing against coastal reefs. The name “Araiso” translates as reef. This is further emphasized in this photo through the use of a small bronze figure on the leftmost jutting point on the stone. So does this element help to complete the display? It certainly adds scale doesn’t it. However, in the context of the ideal that we should allow the viewer’s imagination to complete the picture does the addition of the small figure go too far, or does it help move the scene more towards perfection but still allowing the viewer to use their imagination to complete the scene? For me personally, I would prefer it without the figure, but I can see its use in that the stone has somewhat of an odd shape for a coastal stone with the secondary jutting precipice at the top left. Perhaps the use of the figure centers the viewer that this is a coastal scene and now the imagination of the viewer can be utilized more towards what is unseen in the display. Is the person fishing, staring into the distance attempting to see an approaching vessel, or perhaps just lost in thoughts of someone they miss seeing? Perhaps one can see that with a simplistic display such as this one’s imagination and what our mind’s eye sees can be vastly different than the person sitting next to us viewing the very same display. One can only assume that is the point of this ideal. As we now close this post, how appropriate that the author illuminates this ideal. A great piece of art stirs within all of us an emotion regardless of our station in life or even the troubles we might have that day. For a moment, in its presence our imagination can take over – we can remove ourselves from the outside world to enjoy a brief respite. Nothing in our imagination can be blocked by an outside force from seeing and experiencing beauty, even if only for just a few moments. Our next post will continue with Okakura Kakuzō writing on art appreciation. The Book of Tea (茶の本 Cha no Hon) by Okakura Kakuzō (1906) is a long essay linking the role of chadō (teaism) to the aesthetic and cultural aspects of Japanese life. This essay, or book, was written for a Western audience where the book emphasizes how Teaism taught the Japanese many things; most importantly, simplicity. Kakuzō argues that this tea-induced simplicity affected art and architecture in Japan. It is a 53 page book that can be easily found in PDF format if one has a desire to read and study his writings on this subject. Okakura Kakuzō (February 14, 1863 – September 2, 1913) was a Japanese scholar who made contributions to the development of art in Japan. Okakura was one of the principal founders of the first Japanese fine-arts academy, Tokyo bijutsu gakko (Tokyo School of Fine Arts). He also founded Nihon Bijutsuin (Japanese Institute of Fine Arts) with Hashimoto Gahō and Yokoyama Taikan. Our study of this book was to gain influence into the Japanese aesthetic and a way of seeing beauty. Our desire was then to apply these concepts to our study and practice of suiseki. Today’s blog post will contain a few key quotes from his essay and our thoughts on them. “The long isolation of Japan from the rest of the world, so conducive to introspection, has been highly favorable to the development of Teaism. Our home and habits, costume and cuisine, porcelain, lacquer, painting—our very literature—all have been subject to its influence…Our peasants have learned to arrange flowers, our meanest laborer to offer his salutation to the rocks and water. In our common parlance we speak of the man “with no tea” in him, when he is insusceptible to the serio-comic interest of the personal drama. Again we stigmatize the unnamed aesthete who, regardless of mundane tragedy, runs riot in the springtide of emancipated emotions, as one “with too much tea” in him. What a start to his essay. He quickly grabs the reader’s attention. Tea was introduced to Britain in the 1700s and any student of history understands its significance to the creation of the United States of America. However, how many of us would view a cup of tea in the context in which it is being presented here? We are also struck by his observation “how small after all the cup of human enjoyment is” as insightful for 1906 but how even more insightful for us more than 100 years later. Life is so busy, so full of mundane or meaningless activities. How often can we say our days are full of enjoyment, much less our very lives? Note: Confucius (551–479 BC) was a Chinese teacher, editor, politician, and philosopher of the Spring and Autumn period of Chinese history. 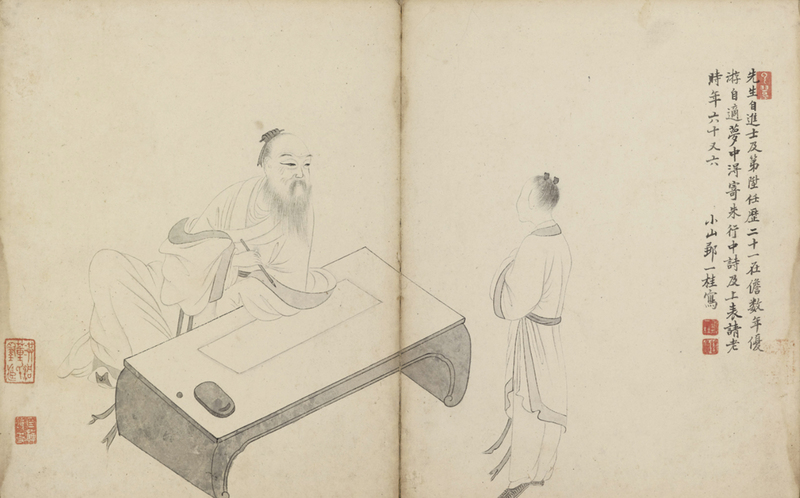 The philosophy of Confucius, also known as Confucianism, emphasized personal and governmental morality, correctness of social relationships, justice and sincerity. Traditions hold that Lao Tse lived in the 6th century B.C., possibly from around 570 to 490 B.C. He served as keeper of the imperial archives or court librarian at Loyang, in Honan province, and was a contemporary of Confucius, though about 20 years older. Sakyamuni is one of the titles of the Buddha, deriving from the name of Sakya where he was born. How do we interpret the author’s view that if we cannot “feel the littleness of great things then we are likely to overlook the greatness of little things in others?” I think of the many times in the evaluation of suiseki how quickly I make a “decision” on what I see! How this initial view entrenches me into a position that with further study holds no value whatsoever. Kamagawa Yase Maguro-ishi titled “Unjo Enbo” translated as Distant View Over the Clouds. Quickly I flipped the pages to the next stone hoping there were better examples to be found. This was more than 10 years ago and over the years I found myself returning to stone A-1 to study and enjoy it. What changed? As Kakuzō so eloquently writes, perhaps I was becoming better at seeing the “greatness in little things.” The Unjo Enbo is plump; it does have a warm feeling. 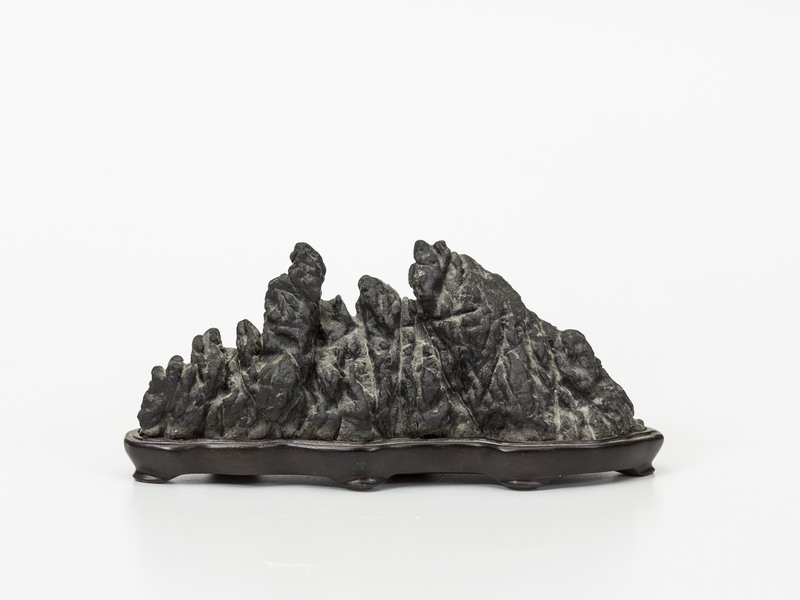 Is it a classical distant mountain stone with sharp peaks – well no – but it certainly does in a romantic way represent a distant view over clouds doesn’t it? I learned from this experience to withhold quick judgments with suiseki. We must study to see what the stone is offering to us and how it speaks to our view and perspectives on life. How does it interact with our surroundings, what memories does it invoke and what feelings are derived from its study? Evanescence is defined as disappear, vanish. There is a dual meaning for me in this statement as the viewing of suiseki leads to both an eventual remembrance and disappearance of memories invoked by the stone itself while at the same time realizing the experience of observing and feeling at that very moment will also vanish quick quickly. So there is a longing of desire to linger in its beauty for a few more moments. As we think of stone display, stones are often placed on a stand or perhaps a white museum box with barely another article surrounding it. There might be a singular colored material covering the display tables. Does this lack of complexity inhibit or improve our aesthetic emotion? Photograph from the 2017 Nippon Suiseki Association Exhibition at the Tokyo National Museum in Ueno Park. Or is it better to add an object, or two, to the scene to better yet contribute to how the stone is received? Does this add to its aesthetic emotion? 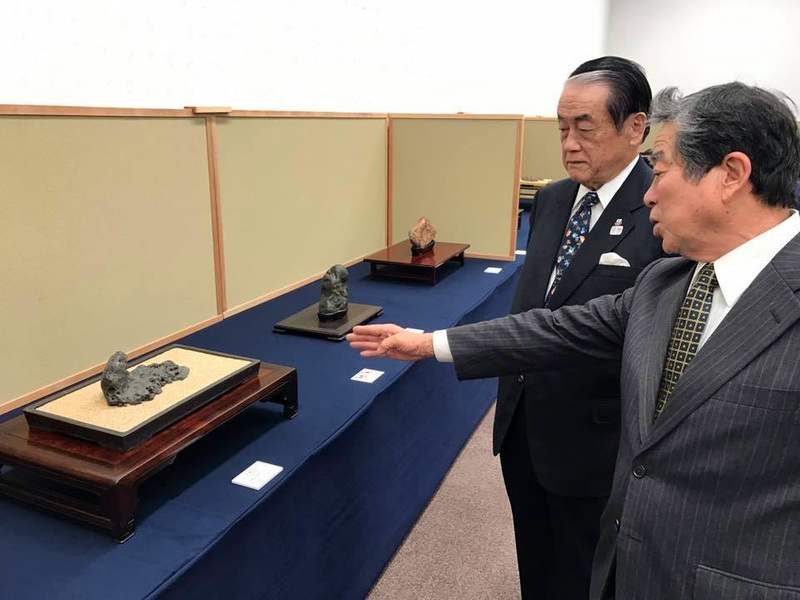 Clearly a exhibition like this has an obligation to its participants to display numerous stones so that its many visitors have an opportunity to see a large collection of suiseki. But from our viewpoint, these types of shows have a very different purpose than that of the historical tea room or the tokonoma found in Japanese homes. 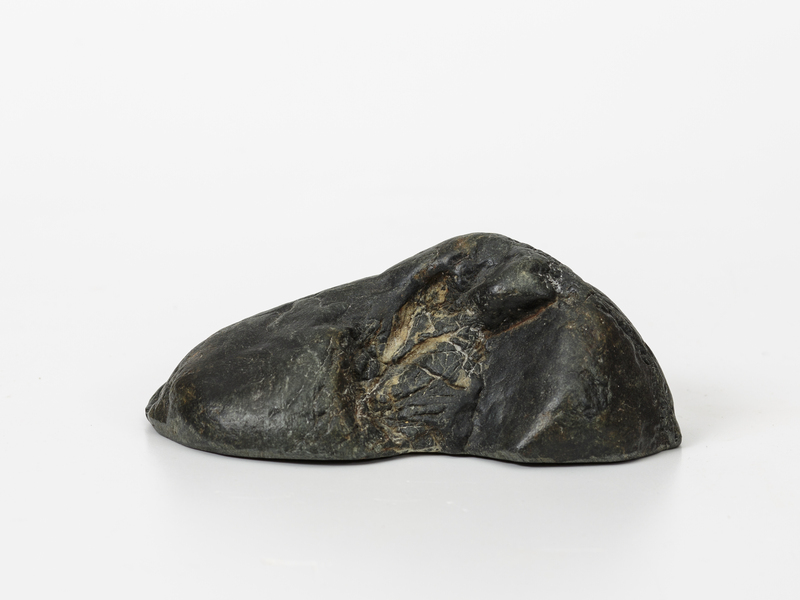 We find that attempting to study stones in a general exhibition is quite difficult due to not only the volume of stones being displayed but also inability to quietly study the stone without distractions such as noise and lighting. This is not to be taken that exhibitions should not be planned and executed, not whatsoever. We are challenging the notion that one can really achieve what is being written by Kakuzō in these types of displays; therefore shouldn’t we attempt to create some type of atmosphere that gains us entry into the tea-room concept for stones? This ideal seems to us to be better achieved in a display such as a Tokonoma. The NSA catalog beautifully illustrates this point with 10-15 types of these displays where the owner/artist can evoke a vision as to their intended purpose in the display. 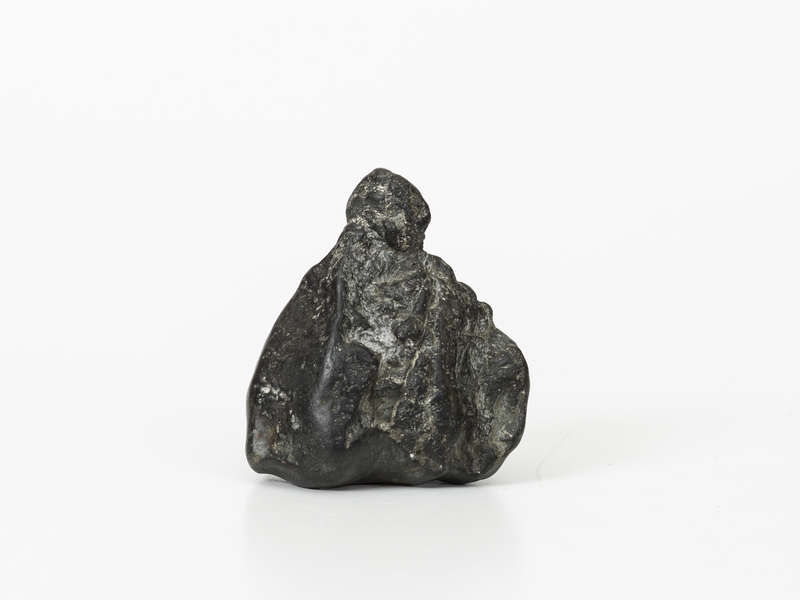 Our collection contains stones that at first do lend themselves to continue to be in our collection. Yet, with quiet contemplation, sometimes over a period of years, we begin to see a hidden beauty in these ancient stones. Is it possible that we needlessly discount beauty simply because we the viewer will not take the time to properly establish the appropriate conditions for study? In addition, even with stones that upon first glance capture our imagination, we find that quiet contemplation of these stones allow us to capture more nuanced aspects of them. In our next blog post, we will further explore Kakuzō’s writing of the tea-room’s characteristics and the importance of same. Tanimoto Hyakusui was a well known collector and seller of Furuya stones and was considered by many to be an expert on these stones. It is rare to find a stone from his collection that is also double-boxed with an album. 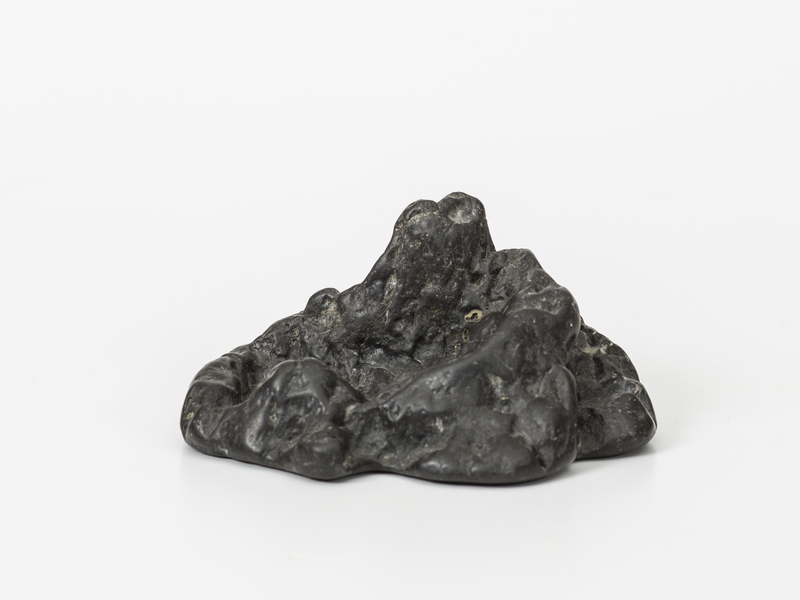 Ryozan literally means “fine mountains” which seems appropriate for the much smoother and fine examples of a Furuya stone like this particular one. This set included a double box. The outer box is made to protect the inner box which contains the various signatures of is owners and the name and type of stone. The brown and green ribbon used to close the box was one of Tanimoto’s signatures. Some double boxed stones have the outer box made in highly polished lacquer, but that is not the case for this stone. Inside the outer box we find the box containing the stone and a secondary layer that contains the album. Inscribed on the box lid from right to left is, “Furuya-ishi’, the two large characters in the center is the stone’s name Ryozan and to the left is Tanimoto’s “Sekiyusai Hyakusui” signature. The album’s outer label reads “Furuya ishi Unkon shi” which means Furuya ishi Stone Record or Album, followed by Tanimoto’s Hyakusui seal. This was a part of the literati tradition dating back to the Edo period of Japan, where honored guests who viewed the stone were asked to paint a picture, write a poem, or record their thoughts. 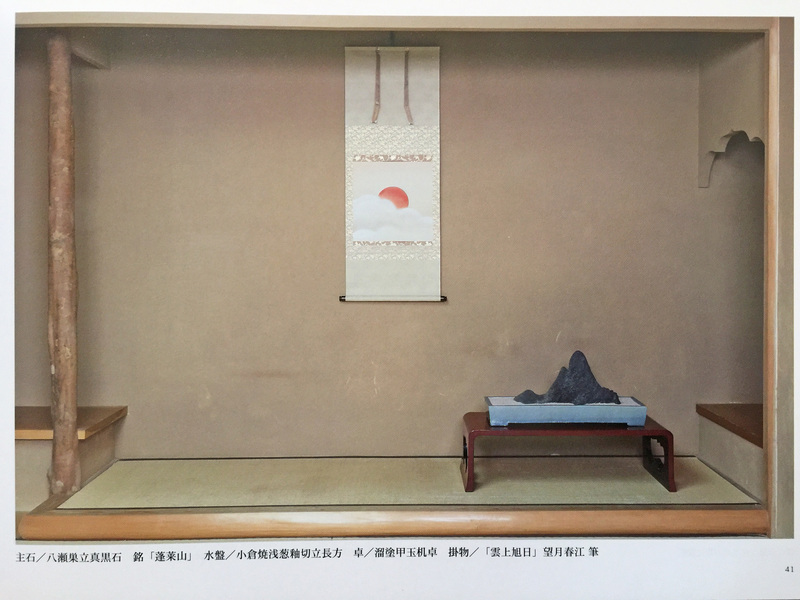 In this instance, Tanimoto himself furnished the stone with the album and wrote the first inscription – it would have been left to future owners to inscribe, or invite others to do so, yet as can be seen no other inscriptions follow that of Tanimoto. Tanimoto’s entry is written in Kanbun, which is a Japanese attempt at reproducing classical Chinese, and is therefore very difficult to understand without specialized training. It seems to say something to the effect of, “Simply placed in the alcove of a room, one cannot help but feel the great wonder inspired by these strange stones (kiseki).” This Chinese style entry and the use of the word “kiseki” rather than suiseki adds to the literati atmosphere of the set. The daiza was carved from rosewood in Japan and is signed by the maker “Kaidou” who was a very fine carver from that time period. Tanimoto was known to carve daizas himself, however, later in life he lacked the strength to carve them in hardwood with precision, so many of his daizas in that period were commissioned to other carvers. This stone was not in his book that he co-authored with Murata Keiji in 1969 entitled An Overview of Furuya ishi Masterpieces. Coupled with the signature on the outside of the box “Sekiyusai Hyakusui” it is assumed he had this piece after the publication of the book, therefore one can assume likely in the 1970s or early 1980s as he used that artistic name late in his career. The stone was acquired from a preeminent collector outside of Japan and our thanks to him for such detailed information on the stone and its history. It is our hope that this recording of provenance is something each serious collector will consider. We have started having kiri-boxes made with the drawer for an album to be stored. Two of them are making their way from Japan to our home as this article is being written. Once they arrive, another article will be written showing where you can find albums to record your own stone’s history. 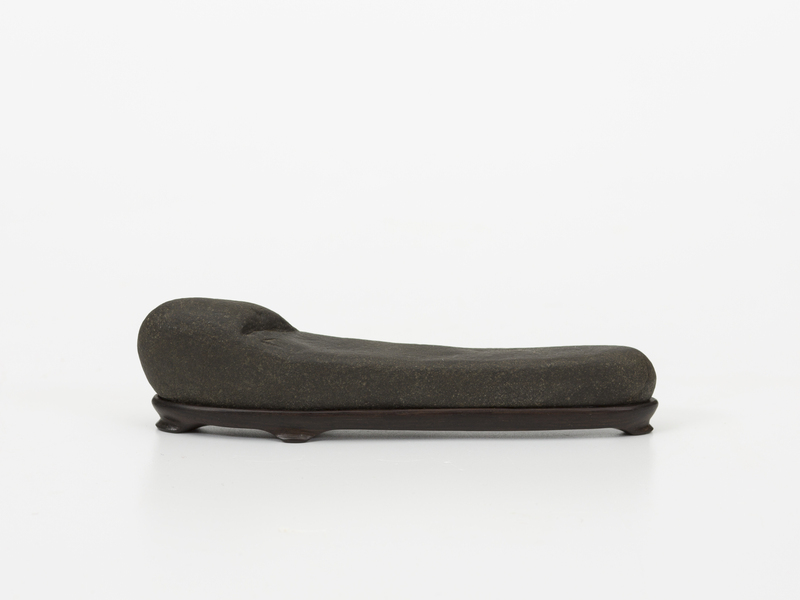 This boat-shaped stone, or Funagata-ishi, is a very small stone at nearly 10 cm in width, but it is highly expressive. The stone is a tad darker than shown in the photograph as we wanted you to see the daiza, unique as it is. Boat-shaped stones are often difficult to come by and one that has not been worked is truly delightful. This is an older suiseki as its patina is just really lovely. We have examined the stone very closely and can find no tool marks of any kind. The daiza maker was very artful in presenting the stone. It has been carved to make it appear that water is rippling just underneath the boat thereby giving it a feeling of movement and three dimensionality. The treatment at the rear of the stone is nicely done as it allows the stone to hang over the daiza. It would have been easy to have made the daiza fully extend to the right, but by reducing it the appearance is greatly improved. This stone may also be shown in a suiban or doban. An alternate expression of display would be a thin slice of highly polished wood to provide a reflection of the stone as if it is gliding through the water or a nice highly polished lacquerware stand. 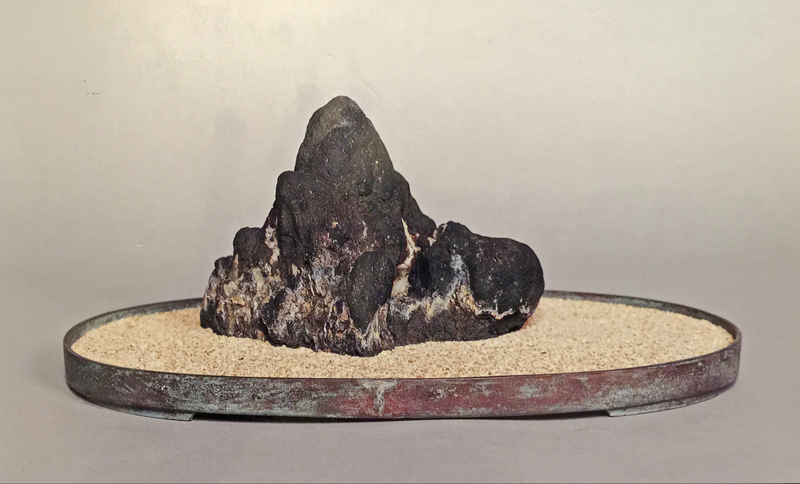 Though this particular stone is without a box, or provenance, it was acquired from Matsurra Arishige’s personal collection of suiseki in 2017. Saturday, October 6th is the last day the Tsukiji Fish Market will close ending its 83-year run as one of the largest fish markets in the world. “The market in Chuo Ward opened in February 1935 after wholesale markets in the capital, including a fish market in the Nihonbashi district, were ruined by the 1923 Great Kanto Earthquake.” More than 500 varieties of seafood can be found there each day with an estimated 90% of all of Japan’s seafood going through this market. We have visited this location several times on our trip to Japan and it is amazing to see the intricacy of the stalls but yet thousands of workers are zipping throughout the market. Once in the market, you had best be very watchful otherwise you might end up underneath one of these speeding carts loaded with seafood. The daily tuna auction, except Sunday and holidays, was always a big draw for tourists. Seeing dozens of fresh and frozen tuna being bid by multiple wholesalers was both fast and furious. Another attraction were the number of shops surrounding the market. From restaurants, to knife shops there was something for everyone. The Tsukiji Fish Market closing is not without controversy however, as many of the long-term vendors are vehemently against moving the market. “If the new place were better, I’ll be happy to move,” said Tai Yamaguchi, whose family has run fish wholesaler Hitoku Shoten since 1964. The 75-year-old leader of a group of 30 women whose families run shops in Tsukiji opposed to the move, Yamaguchi feels it has been mishandled by authorities who failed to fully consult those affected. “They are hiding so much,” she said. “Tsukiji now has more than 500 wholesalers employing several thousand people. About 40,000 people visit each day. Much of the angst over the move has to do with closing down a beloved local institution. A labyrinth of quaint sushi stalls and shops selling knives and ice cream encircling the huge wholesale market famous for its predawn haggling over deep-frozen tuna and other harvests from the sea, Tsukiji has been supplying Tokyo’s fancy restaurants and everyday supermarkets since 1935. Its origins date back nearly a century. As with any significant change, small vendors are more likely to be hurt by this move and those shops will certainly take a huge hit in business. The Tsukiji Fish market has been a staple of fresh fish for Tokyo and beyond since 1935 and it is sad to see it close for what will likely be just more apartments, shops or something that will not have the memories and special feelings of this market. For those of us who have had the opportunity to visit this amazing place, we are sad it is closing but thankful for the many memories we have. We also wonder where Jiro Ono will get his fresh fish everyday? Well it seems the new market is not too far away! Paul and I are offering a number of suiseki for sale. Please email me at “suiseki at yahoo.com” with any questions or requests for more photos. Shipping costs will be determined at the time of the sale and will be dependent on the number acquired and the shipping address. Thanks! 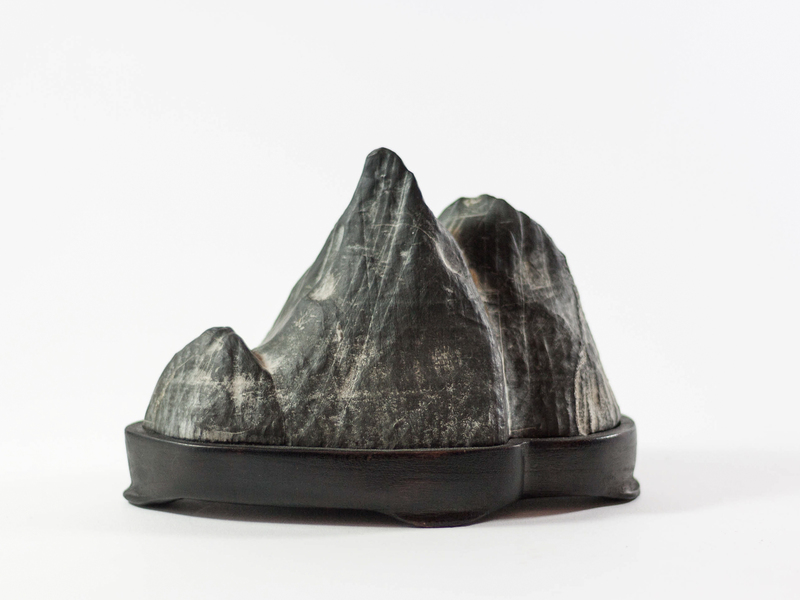 This expressive mountain viewing stone is eye catching! Collected in Clear Creek, CA, this Jadeite has a tall peak and a shorter peak. Stone has been cut and fits nicely in a daiza carved out of African Walnut. Stone measure 26 cm wide, 13 cm high and 13 cm deep. $265. This beautiful, exhibition quality, mountain stone is from the Ibi River in Japan. This stone is sure to be a center piece of any stone collection. It provides grand and imaginative scenery with its peaks and valleys from ever angle. 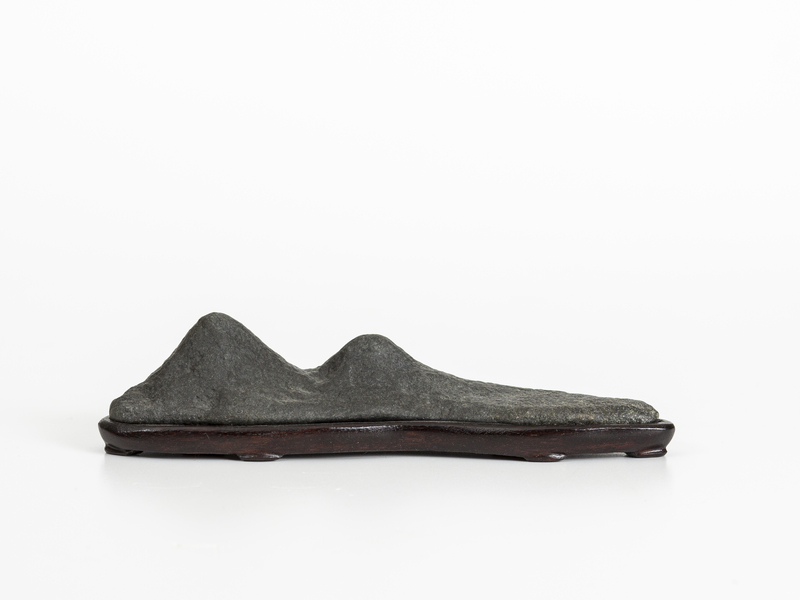 It is truly a evocative piece of natural art with the typical Japanese style sand blasted bottom and some grinder marks on the back bottom edge and the right edge. The marks in no way affect the over all appearance of this awesome stone. Stone measures 29 cm wide, 10 cm high and 20 cm deep. $395. This unusual stone from the Tobetsu River which is on the northwestern side of the Japanese Island of Hokkaido is sure to be appreciated by the true stone connoisseur. This stone with a deep cavern in the center was aptly named “Dragon Lives on the Edge.” This stone was a part of the esteemed Suiseki Association of Hokkaido Exhibtion two years ago. The softwood daiza fits the stone perfectly and is obviously crafted by an expert daiza maker (Unsure of the craftsman’s name). Stone measures 12 cm wide , 13 cm high and 10 cm deep. $295. 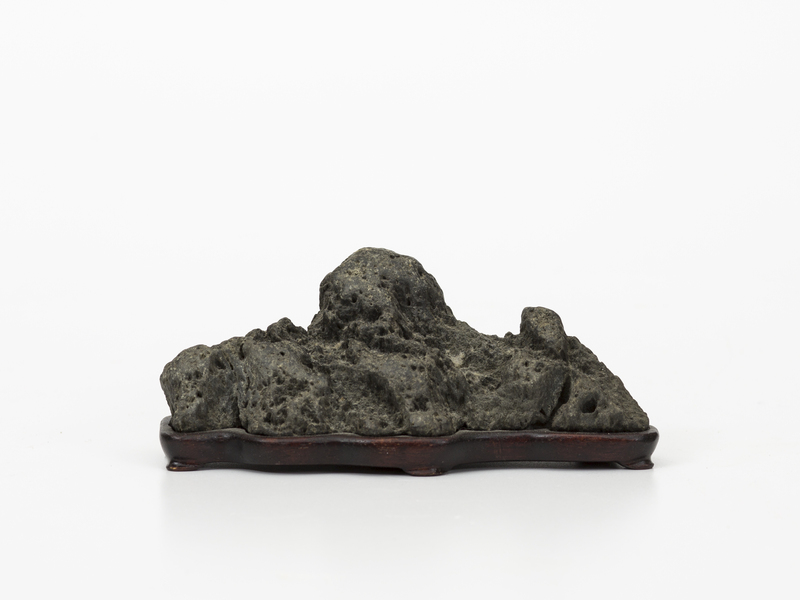 This little mountain stone came from the Harry Hirao Collection. Uncertain as to which Southern California river Harry collected the stone from, although it resembles materials taken from the Eel River. 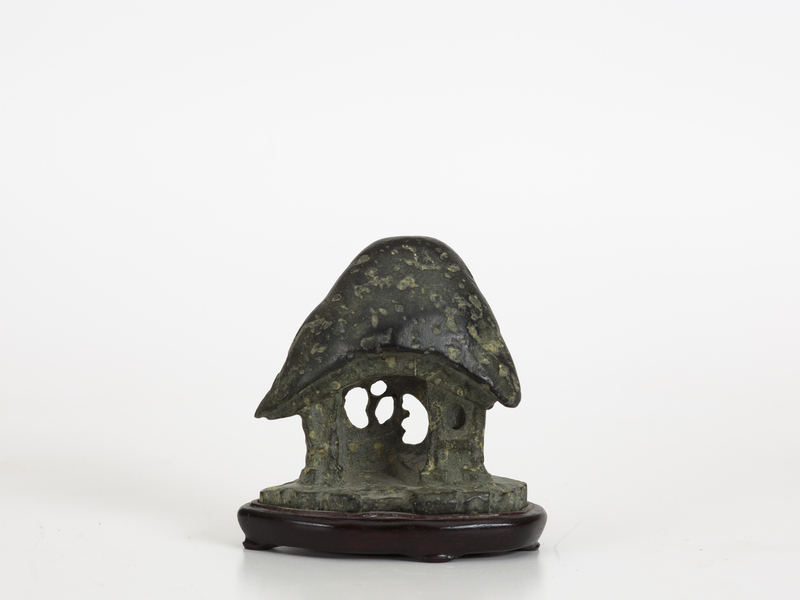 Its natural base fits nicely in the rosewood daiza and is 7 cm wide, 5.5 cm high and 5.5 cm deep. $115. 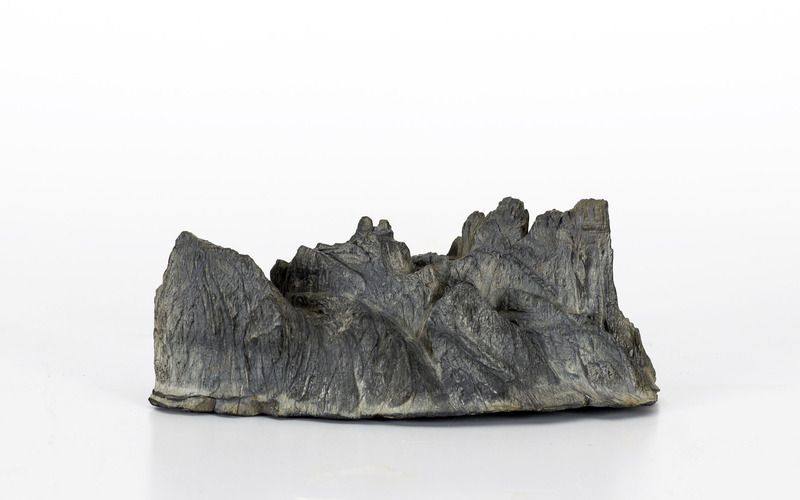 Ligurian Alps Stone –PG5 This charming little, palm sized stone has three distinctive peaks and a natural bottom. Collected by the late Nelda Rodriquez, outstanding suiseki artist from Puerto Rico. Nelda’s initials are on the bottom of the daiza. 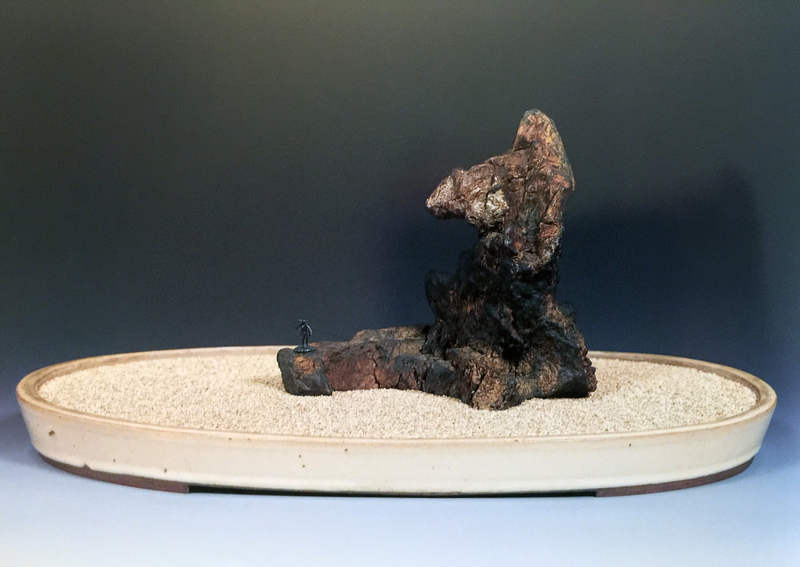 Works as a complimentary stone for bonsai or as a stand alone viewing stone. Size 16 cm wide, 11 cm high and 8 cm deep. $295. 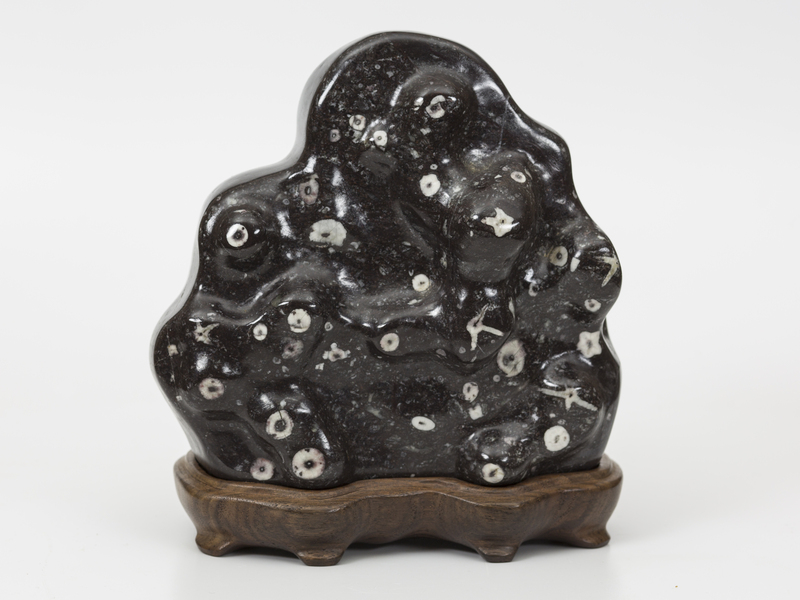 SE-1 Flower Stone – Japan – 17x9x16cm – $400; the front of the stone has been lacquered and the back has not. 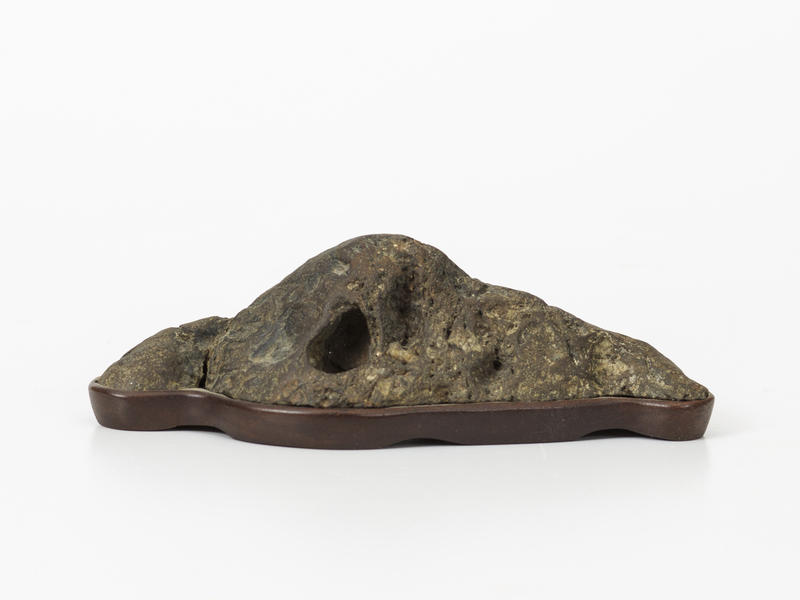 SE-2 Japanese Carved Hut Stone, 8x6x9.5cm – $450; this stone has been highly carved and is not a natural stone; however, it is a lovely form and could be easily used in a bonsai or kusamono display. 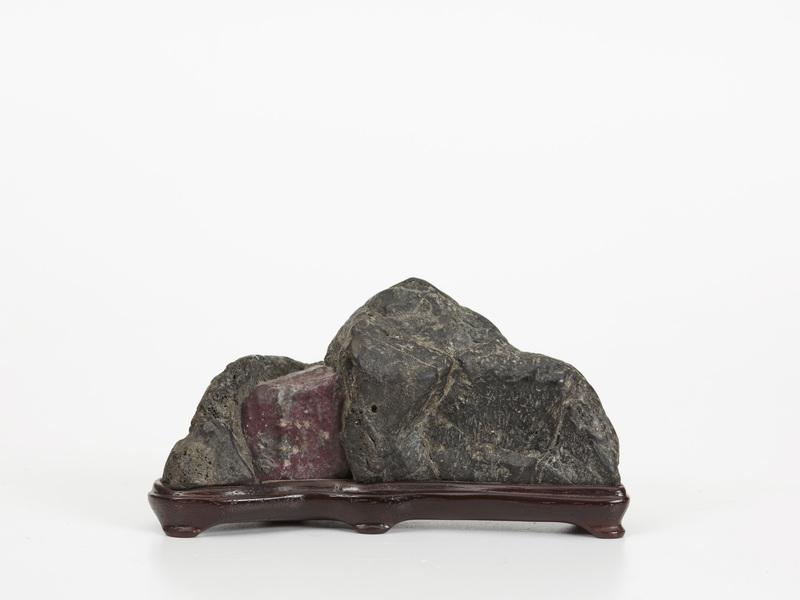 SE-3 Japanese Waterfall Stone, Red Lava – Previously Owner is Chuji Sugii and Koji Suzuki – 11x4x5.5cm – $700; The daiza was crafted by Koji Suzuki and previously owned by Chuji Sugii as prolific collector from Kyoto, Japan. This stone doesn’t have Sugii’s normal sticker but I can confirm in was in his collection as I purchased the stone directly from Koji-san. 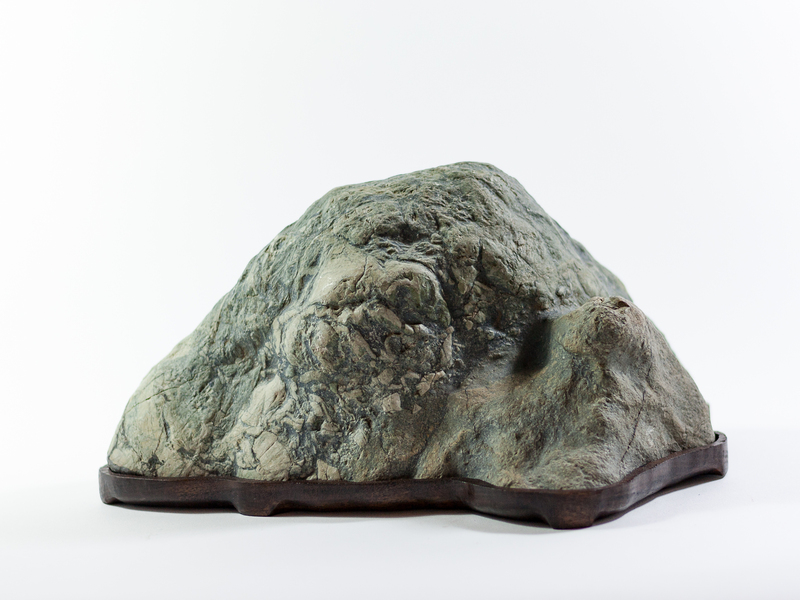 [SOLD] SE-4 Setagawa – Doha – 13×11.5×5 cm – $300 (small crack in daiza); a very fine patina on this stone with a well made daiza sans the crack. [SOLD] SE-5 A Ligurian mountain range. No daiza but can be used in a suiban or doban. 12.5 x 5 x 5 cm. $250; do not place this stone in water at any time as water impacts the surface texture. It is very difficult to photograph this stone to show the fine surface textures. Ligurian stones from Italy are highly similar to Furuya stones from Japan. [SOLD] SE-6 Kamogawa – 15x4x3cm – $175; I assume this is a worked stone so be conscious of that if your aesthetic doesn’t allow for those. 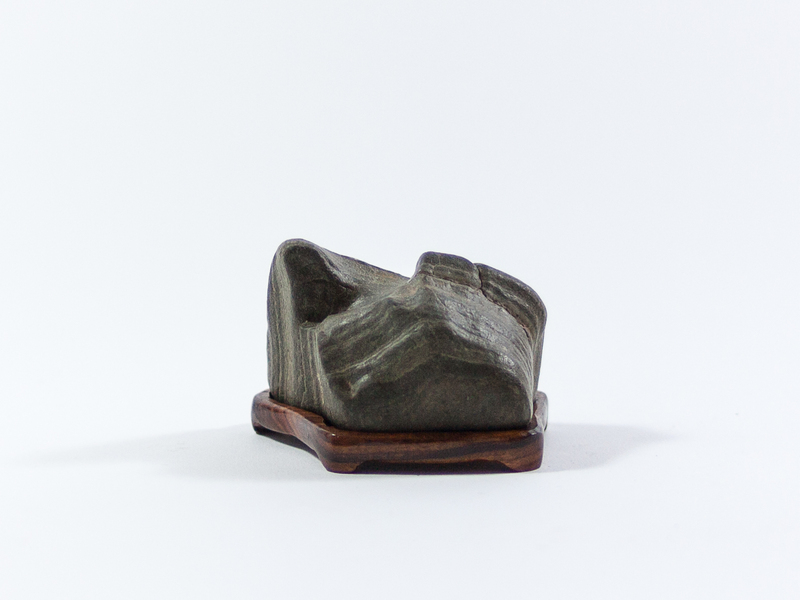 [SOLD] SE-8 Kamagawa Hut Stone – 11x7x7.5cm – $200; a natural stone, surprising since most hut stones have been heavily worked. 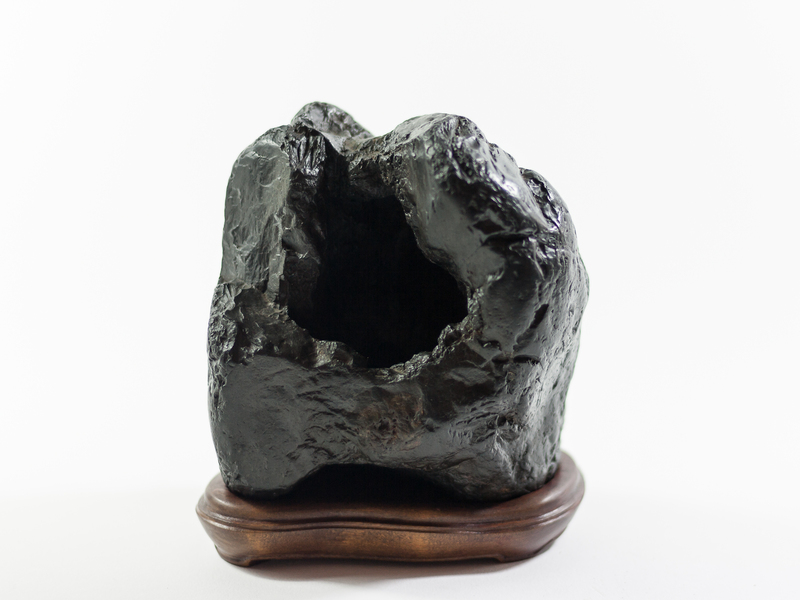 [SOLD] SE-9 Mountain Stone – Washington State – Black Jadeite – 17x9x7cm – $275; very good patina on this stone with a very pleasing shape. 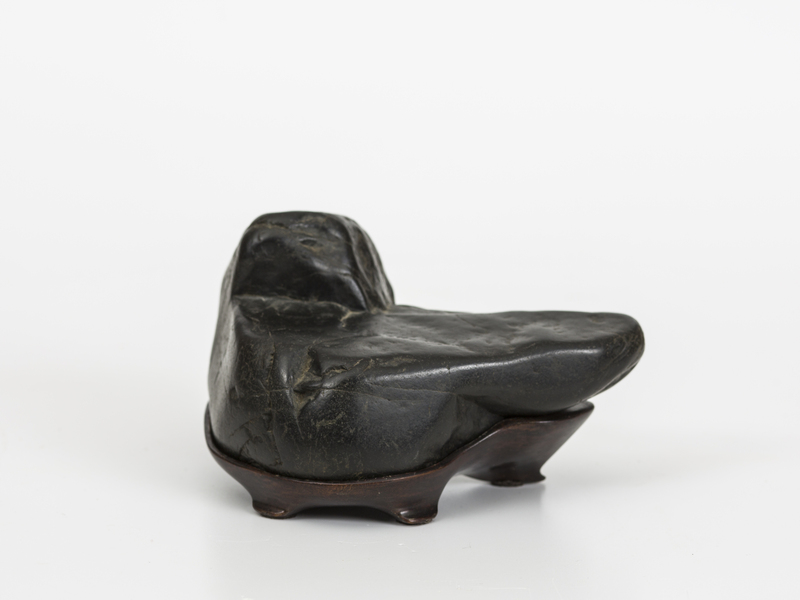 SE-10 Seigaku – 16×6.5×6.5 – Some see a human on the left side – Excellent daiza – $450; not an inexpensive stone for its size but it is an excellent small stone with a beautifully made daiza. 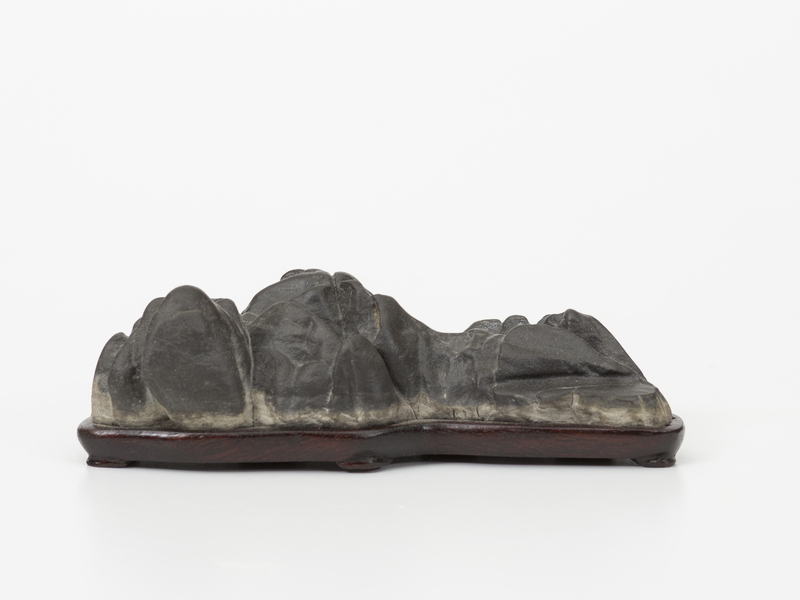 SE-11 Seigaku – 15x6x6cm – $200; a quieter stone than above. It almost looks like a Furuya stone. 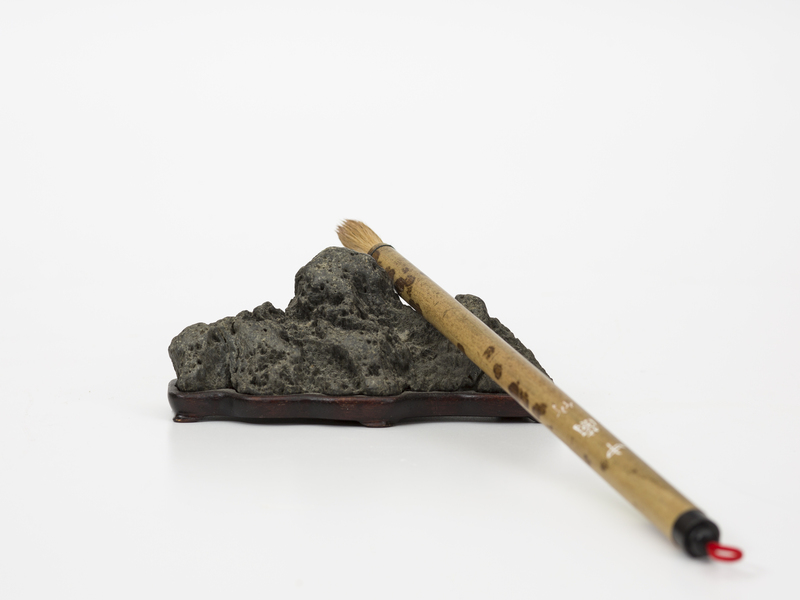 SE-12 Sagigawa – Can be used as a brush rest – 14x5x4cm – $300; a nice literati stone if used as a brush rest or from a Japanese perspective a good mountain stone. A very rough texture with good movement. 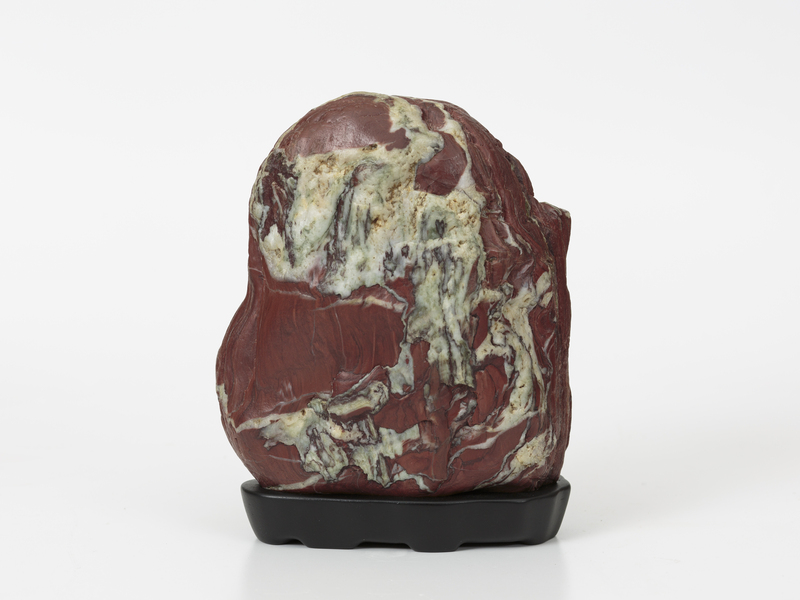 SE-13 Sagigawa – 16x5x6cm – A truly lovely stone, well shaped with a nice daiza – $375; An excellent stone with terrific movement, excellent location of the peaks both left and right. Overall a stone that is visually very pleasing. 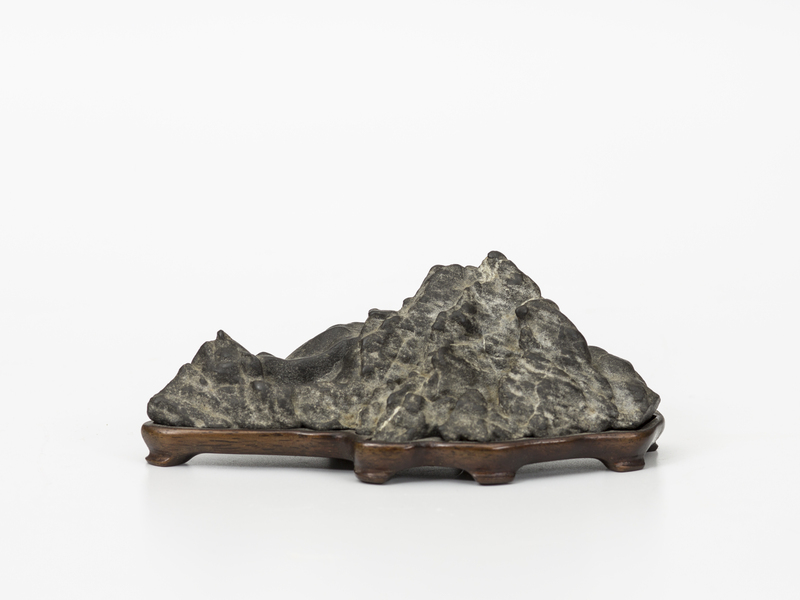 SE-14 Japanese, Mountain with distinct pool – 11x7x5x6.5 – $125; a fine patina for this mountain stone with a large lake – hard to see in the photograph. This is a cut stone on the bottom with good finish work. 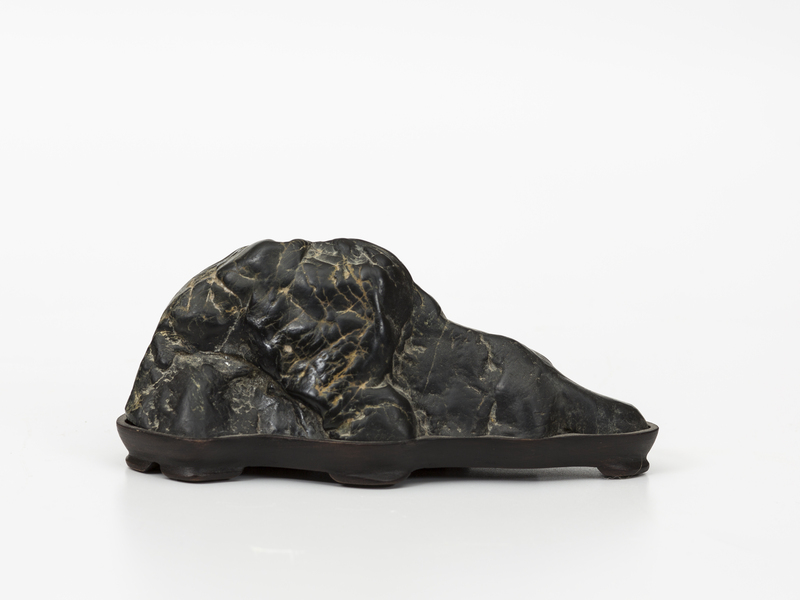 This stone can be displayed in a suiban or with a daiza; no daiza is included. 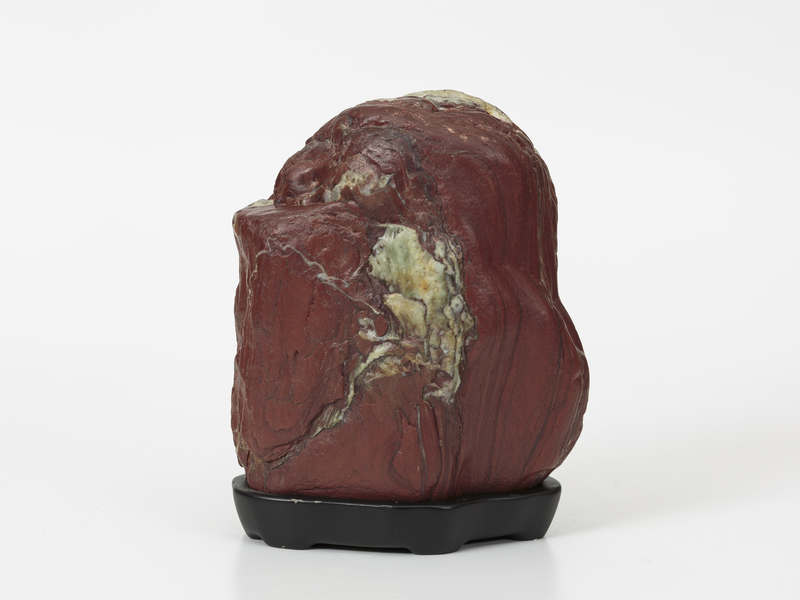 SE-15 Figure Stone – Seated person – Japanese – 6x4x6cm – $75; One might see a see a sumi-e artist with a robe in this stone as he/she sits to create an artistic expression. 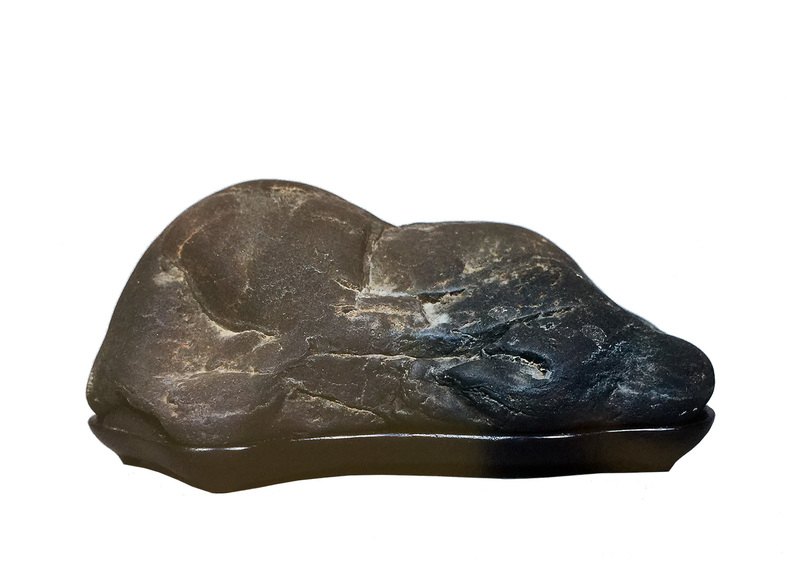 SE-16 Black Butte Mountain Stone – 12x6x4.5cm – $160; the patina is beginning to develop nicely on this newer stone. It has a cut bottom, thus having a daiza built for it will be simple. Lovely jasper colors in reds, yellows, white and black. 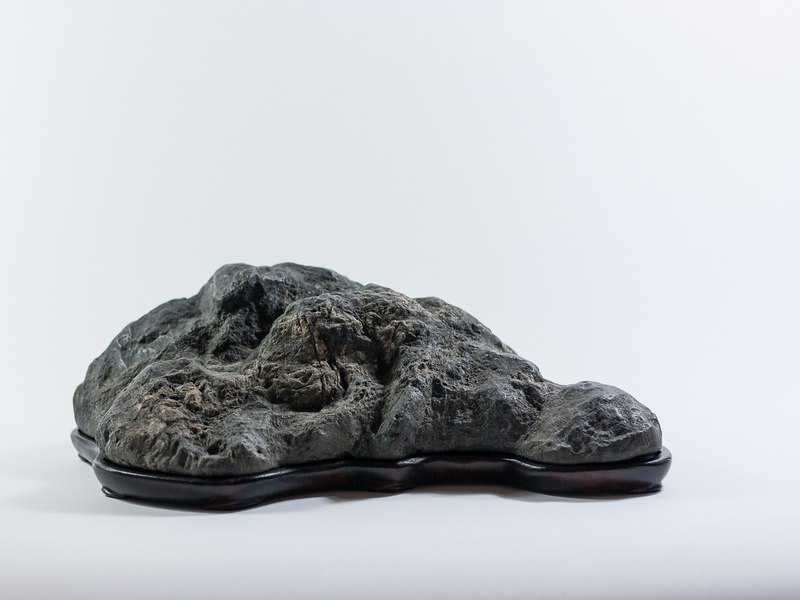 SE-17 Eel River Mountain Stone – 13×6.5×5.5cm – $150; reminds me of the Bay Area after heavy rains when a portion of the mountain slides. A cut stone. 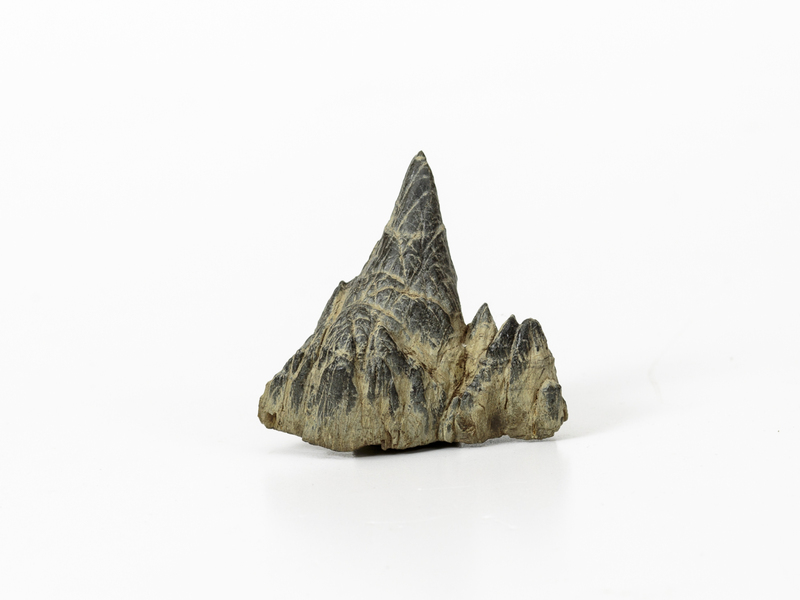 SE-19 Ligurian – 6x4x5cm – Nice for a doban or small daiza – $50; we enjoy these tall peak stones – they are quite small but are fun to display in a small suiban. 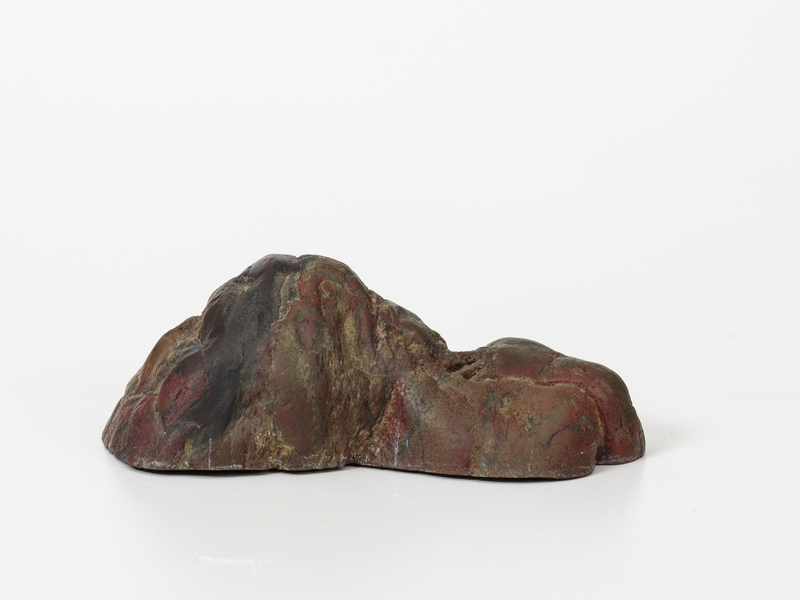 SE-21 Norther CA Red Jasper – 13x7x14 – $200; note the figure on elephant or horseback in the bottom left and notice how the rider’s head is thrown back and connected to the cloud above. There is also a figure like element to the right/bottom of the stone. On the back side is another figure (below) that stands out quite well. Some don’t appreciate these kinds of stones but we enjoy both the color and how the imagination can be used to visualize its textures.